An article on Business Standard (BS), offers an interesting finding. Since the beginning of the year 2016, many wealthy individuals are borrowing money from the Non-banking financial companies or NBFCs to invest in Initial public offerings (IPOs). As a result, the NBFC arms of brokers such as Edelweiss, IIFL, JM Financial, Reliance Securities, Kotak Securities are making money by financing them for the IPOs. With the increasing appetite, the interest rate charged for the loans has come down too. Thus encouraging more individuals to borrow and invest. All this has led to sharp surge in the HNI (High net worth individuals) activity in some of the recent IPOs. 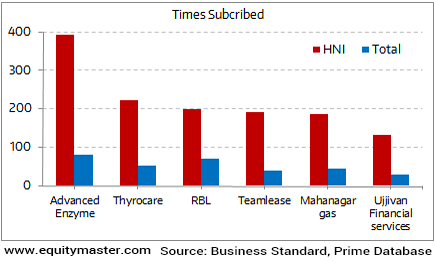 Given such a large number of HNI applications in the IPOs, their allotments are also bound to be higher. So the price at which the stock will start trading at will be much higher than its issue price. The oversubscription numbers, may lure the small investors too, to invest.